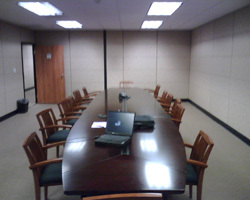 Portland Court Reporters Suite is located in a prestigious part of the Central Business District of southwest Portland. With close proximity to I-5 and Hwy 217, this TO&A Center provides easy access to Oregon’s “Silicon Forest“. Our court reporting clients will enjoy the use of a well-appointed reception area and fully furnished conference/deposition rooms which can accommodate up to 36 people in comfort. A Business Lounge is also conveniently available. Videoconferencing, an LCD projector and on-site administrative, technical and fully trained deposition support staff are available to all clients. The building and floor are accessible 24 hours a day, seven days a week, and there is abundant parking. Other building amenities include and on-site lunch restaurant, coffee and sandwich bar, and fitness room. Locally, the Center is a quick 20 minute drive from Downtown Portland, and just minutes from several hotels and a variety of restaurants.